Inspired by conversations on the FOOD52 Hotline, we're sharing tips and tricks that make navigating all of our kitchens easier and more fun. Today, we're talking about cornmeal and its friends. Don’t you hate that feeling that the world is out to get you, to confuse you, to trick you? When it comes to polenta, grits, and cornmeal, this feeling is warranted: there are no rules about the marketing and labeling of these products. No standardization. No regulations. The same bag of ground corn can have all three words on it, tricking consumers into thinking they’re the same thing. Throw masa into the mix, and it's pure mayhem. We’re here to boil it down for you, explaining the best types of each product, and what their names really mean. No more consumer panic allowed. Polenta and grits both fall under the heading of cornmeal, which is simply a coarse flour (a “meal”) ground from maize (field corn). Leave anything labeled “instant” or “quick-cooking” on the shelf; this means it’s been par-cooked. It will be lacking in that corn-flavor you’re looking for. Look for the words “stone-ground” when shopping for any kind of cornmeal. Unlike commercially-produced cornmeal, stone-ground cornmeal still has the hull and the oil-rich germ of the kernel attached. “Degerminated” cornmeal means that the hull and germ have been removed. 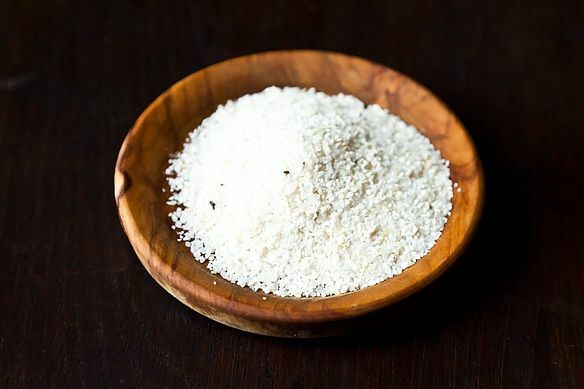 The grind: Grits are typically coarse-ground cornmeal. White or yellow? According to Anson Mills, white corn was historically popular in the urban port cities of the south, while yellow corn was predominantly used in the inland, rural areas. Today, white corns generally carry more mineral and floral nuances than yellow corns. Uses: Try the Southern classic Shrimp and Grits, or mix grits with goat cheese for these Creamy Goat Cheese Grits. What’s in a name: In the United States, “polenta,” like “rice” and “beans,” can refer to both the ingredient and the finished product. 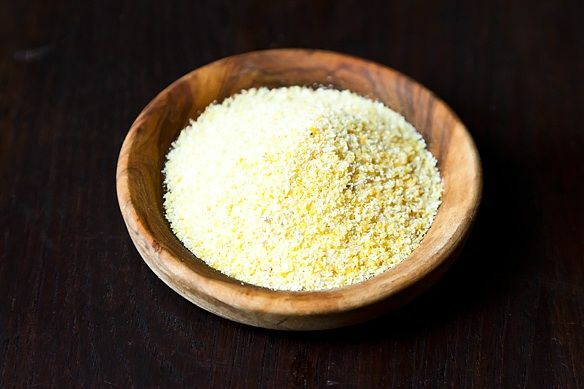 The grind: While some cornmeal products may specifically be labeled “polenta,” there’s no need to limit your search; medium and coarse-ground cornmeal are best for making polenta, whether it says “polenta” on the bag or not. Uses: So many possibilities! Eat it for breakfast with blueberries and almonds; put it under a Short Rib Ragu; form into griddle cakes; top with fried eggs and escarole. 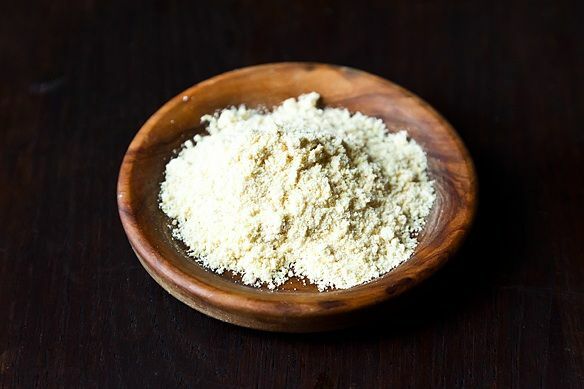 The process: To make masa (or hominy), field corn is dried and treated with a solution of calcium hydroxide (or “slaked lime,” or wood ash) -- a process called "nixtamalization." When fresh masa is dried and ground, it becomes masa harina. This process of treating ground corn with an alkaline solution loosens the hulls from the kernels, allowing the nutrients to be absorbed into the body easier than with regular cornmeal. Uses: Unlike untreated cornmeal, masa simply mixed with water can form a dough. This dough can be used to make corn tortillas and tamales. How do you use your cornmeal products, and do you see a difference? Let us know in the comments! I’m not much a cook. I used to get tamales that were said to be made from grits (for the outside). Wonderful taste. Any suggestions as to how to make? Masa just means dough. Harina means flour. So tortillas made from having are usually made with Maseca flour and water. While tortillas de maîz and made from boiled dried corn with lime, then ground. At least in El Salvador. White corn. The word harina can be any type of flour, like flour for bread or cakes, for example. I don't get it. Why do you think grits and cornmeal are the same thing? Grits are ground hominy - which is corn that has been treated with lye. Two completely different products. Similar. But not the same thing at all. I just made corn muffins out of corn grits, and they turned out perfect, also made polenta too, for dinner later with vegtables. Glad I found this site. So it's okay to use cornmeal to make cheese grits? I ask because I'm from the Philipines and all cornmeal, grits, polenta etc are imported. I buy Bob's Red Mill. I want to make Cheesy Shrimp Grits for a special breakfast but what I have on hand is medium grind cornmeal. I hope someone can help me. Thanks! This is a super late answer, but yes, you can use cornmeal to make cheese grits! My all-time favorite thing to make with cornmeal is cornmeal mush. You cook it in a bit of water like you would Cream of Wheat, and let it become very thick, then pour it into a butter-greased loaf pan and refrigerate it. When it is solid or the next day, cut 1/4" inch thick slices, dredge them in flour, and fry them in a skillet until they are slightly golden and crisp. I prefer them with just plenty of cold butter slathered on while they're hot, but others like them with maple syrup. I also make large batches of my own cornbread mix then package it as individual kits for a single meal. For example, I have some cheese-laden crab and spinach dip leftover. I'll either stir that into a pot of cornmeal for a really rich bowl of "grits," or make myself an au gratin dish of polenta topped with it -- that and a salad will make me a great lunch. At our house, though, the number one favorite polenta is pepperoni pizza -- about two inches deep of cheese polenta topped with tomato sauce, grated Mozz, pepperoni and olives, then baked until the cheese melts and it's all bubbly and delicious. Masa is the Spanish word for dough, Masa Harina is the flour that is used to make Masa for making corn tortillas and tamale dough. Hominy is known in Spanish as Maiz Pozolero and is what you are describing as being treated. It is also available in cans, both small and large, usually used for making Pozole (Pork and Hominy Stew). I recently 'toured' Kenyon Grist Mill in Rhode Island, at their annual Johnnycake Festival. Aside from eating wonderful jonnycakes, seeing the mill in operation was a treat! It's exactly as it was over 200 years ago -- with electricity added. There is presently only one wheel in use, and we watched as the corn was added, ground by the old stones, and delivered into a barrel on the floor below; heard about the maintenance of the stones; and more. Take a look at their website. You make cornbread with cornmeal, sometimes other flours also. Look at the upper right of the screen, where it says Search... Put in 'cornbread' and set it to 'Recipes' if it isn't already, then click on the magnifying glass icon on the right. You'll find many wonderful recipes there. Susan G, you missed the joke - they are all 'cornmeal'! 'Cornmeal' as such, isn't on the shelves in Australia. I made some cornbread recently, and used 1/3 wheat flour, and 2/3 polenta with some added baking powder, sour cream, tasty cheese, and chopped jalapeños! Tasted great (even if not authentic) served with fried chicken and coleslaw! Sounds perfect -- a little more bite. You could post the recipe and teach us something. Cornflour (one word) as used in Australia, New Zealand, and maybe England is the same as cornstarch in the U.S. Cornmeal (two words?) as sold in the South of the U.S. is a mixture of ground corn, self rising/raising flour and salt, facilitating the making of cornbread. I believe the best polenta is milled from northern flint corns such as Roy's Calais from Vermont. Coarsely milled, then screened, the large hard chunks of the higher protein flint corn make for a wonderful creamy textured polenta. The finer screenings are fine for mush, baking or added to griddlecakes/waffles. How does corn flour fit in here? Depends on where you are. In the US, we have corn starch, which in the UK et al is known as corn flour. Bob's Red Mill markets something they call corn flour, and it's just a very finely milled corn meal. I'm confused. You're using the terms masa and hominy synonymously, but most of the packages of grits that I've seen say "hominy grits." This doesn't seem to indicated that the stuff has been treated with the calcium hydroxide solution though; I mean, they're still grits, not masa. Please explain? Thanks. Great stuff! 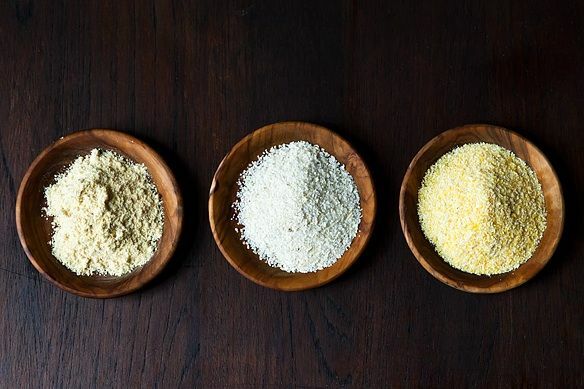 At our mill we produce cornmeal and grits at the same time; grits are the coarser by-product that doesn't get sifted. Usually 8 lbs. of cornmeal will leave us with 2 lbs. of grits.